More than 1,000 tech and robotics experts — including Stephen Hawking, Elon Musk and Steve Wozniak — warn an AI arms race is on the horizon. And it could happen in a matter of years, not decades. Imagine an armed helicopter that can search for and kill people based on certain pre-defined criteria. Or an artificially intelligent robot outfitted with weapons performing pre-programmed patrols, without any human intervention. It may sound like something out of a science-fiction movie. But more than 1,000 tech and robotics experts — including Stephen Hawking, Elon Musk and Steve Wozniak — are warning that an AI arms race is on the horizon — not within decades, but years. In an open letter published Monday, the group calls for a ban on offensive autonomous weapons. "If any major military power pushes ahead with AI weapon development, a global arms race is virtually inevitable, and the end point of this technological trajectory is obvious: autonomous weapons will become the Kalashnikovs of tomorrow," the letter says. It also warns of a potential black market, which could put AI weaponry in the hands of terrorists, dictators and warlords. With minds like Hawking and Musk backing the letter, some people on Twitter are taking the warnings to heart. Both Hawking and Musk, the Canadian-American business magnate behind SpaceX and Tesla, have spoken out about artificial intelligence in the past. 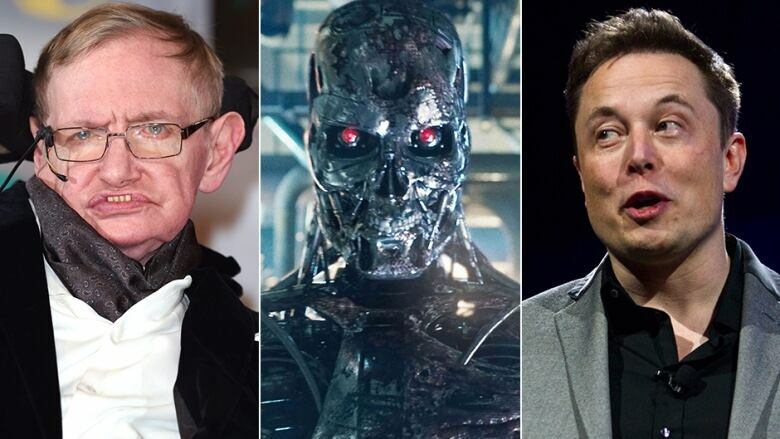 Hawking has said, "the development of full artificial intelligence could spell the end of the human race," while Musk suggested that AI is probably "our biggest existential threat."